Bruce Springsteen says his classic song “Born to Run” is about people looking for “connection.” The great crime novelist Andrew Vachss fills his stories with people forming “families of choice” to retain their humanity against the brutal outside world. 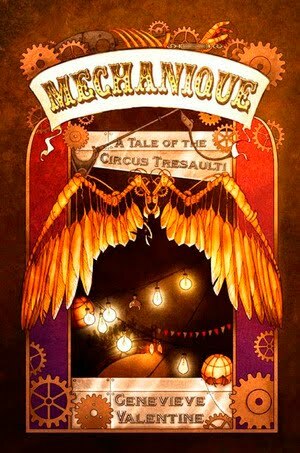 And in the same vein, the heart of Genevieve Valentine’s Mechanique: A Tale of the Circus Tresaulti shows how the bonds of family can form between and among people who otherwise have nothing in common. [frame align=”left”] [/frame]If you have to give it a genre, I suppose Mechanique counts as steampunk. Or fantasy. Some aspects verge on science fiction. But it plays with these conventions as much as it does with narrative form. It’s not set in the past, like steampunk, and it’s not about technology, like science fiction. Its landscape is post-apocalyptic, but with no set time frame (or even confirmation that it’s actually set on Earth). And there is a sense of magic to what happens, but it’s so grounded, so organic and mundane, that it’s as far from the standard tropes as you can get. None of this really matters, though, because ultimately it’s about people-building, not world-building. Via a fractured narrative point of view, we learn that the circus, led by the enigmatic woman known only as Boss, features performers that are part metal, with hollow copper bones to make their feats that much more astounding. One even features the enormous metal wings shown on the cover, but he’s dead when the story begins. Which doesn’t mean he doesn’t figure in things, because Valentine jumps back and forth, changing point of view and time frame whenever it suits her. The story is most often told by Little George, a boy of indeterminate age who works as Boss’ go-fer. Through him we learn the complexities of the Tresaulti personalities, and a bit about how some of them came to join the circus. It’s a real tribute to Valentine’s skill that this is never confusing or disorienting. If there’s a criticism to be made, it’s that the plot takes so long to get going, it almost seems like an intrusion. For its first half Mechanique is a brilliant high wire act of a mood piece; the events of the second half jar only because of their relative normality. But that’s minor, and ultimately the second half wouldn’t work without the emotional investment of the first. I’ve known Genevieve for several years now, mostly as a delightful raconteur at conventions and a deliciously snarky columnist. I’d read some of her short fiction, but nothing prepared me for this, not even hearing her read the first few chapters at last year’s World Fantasy Convention. She’s created a unique world here, and made a brilliant debut as a novelist. Come back Wednesday for an interview with Genevieve Valentine. This book is on my hold list at the library. Now I really can't wait to read it.